There’s a “new” climate campaign in town. Over the last year and a half, the Sunrise Movement and its allies have promoted an energy infrastructure plan known as the Green New Deal so effectively in the US that the policy now features on most pundits’ “2019 climate items to watch” lists. The team at Climate Advocacy Lab wanted to highlight some of the key public engagement and movement-building aspects of this policy and campaign. We are a project that supports climate and clean energy advocates to develop evidence-based best practices for mobilising Americans, and there’s a lot of research out there that helps explain why the campaign to put the Green New Deal on the map has made such progress! First, the policy itself. While the Green New Deal (GND) actually isn’t a new idea (see Vox’s backgrounder), there are unique aspects of the policy with implications for how we organise people in support of it going forward. A fully implemented GND would rework the entire US economy in a way that would dramatically cut carbon emissions, while ramping up efficiency and clean energy and creating lots of jobs in the process. The boldness of the policy is likely part of its appeal for many, as research shows a visionary narrative can help garner support and spur action. 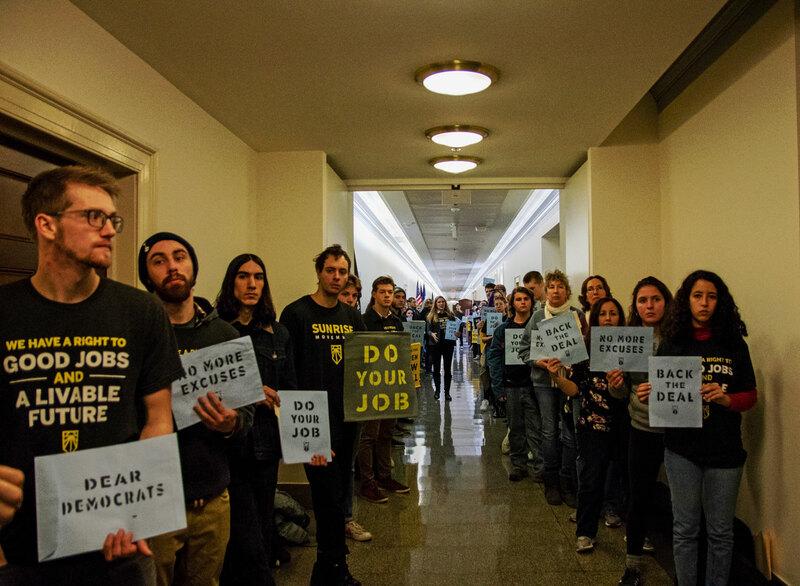 In the US, the economy and jobs rank as higher priorities than climate change or the environment for Independents and Republicans (and some Democrats), so the GND’s focus on job creation could give it broader public appeal than other climate policies. As conversations continue on how to ensure that any GND is just and equitable, the potential benefits of making it so are real, based on the broader base of support those resulting policies could attract. Case in point, the recently passed Portland Clean Energy Initiative (which created the first-ever fund for climate justice in the US) serves as a blueprint for what the sustainable transformation of our economy and our communities might look like in practice. Previous polls (here, here, here, and here) showed broad public support for GND-esque policies that create jobs while reaping climate gains, but as of December 2018, 80+ percent of Americans had heard “nothing at all” of the GND. As media coverage (both positive and negative) of the GND increased, public opinion split along predictably partisan lines. Sometimes more than the message itself, research shows the messenger can have a big impact on how a campaign or policy proposal is received. So the vocal support of progressive leaders like Alexandria Ocasio-Cortez, the recently elected Democratic representative from New York, is undoubtedly one reason why many progressives have shown enthusiasm for the GND. And, the GND being championed by Sunrise Movement—a group “building an army of young people”—is surely one of the reasons so many young people have shown support. Conversely, these messengers may be met with more skepticism by conservatives and others. With coverage of the mass protests and sit-ins that Sunrise Movement and others organised in recent months amplified through social media (particularly via Facebook Live and Twitter), the effective strategy and tactics of the Green New Deal push have prompted almost as much discussion as the nuts and bolts of the policy itself. And Sunrise Movement’s success (in partnership with the progressive political action committee Justice Democrats and many others) in increasing visibility around and public support for the bold suite of policies encompassed in a GND was not merely luck. Long before they laid out specific campaign goals around the GND, Sunrise members spent time studying wins and losses of the climate movement over time. “As young organisers who grew up in the climate movement, we felt we should organise young people—thousands of them—to bring moral clarity that we needed to stop climate change and tell a unique story that a few very wealthy people were standing in our way,” explains Sunrise founding-member Victoria Fernandez. A number of their activists attended workshops by the US group Momentum, which train movement leaders on how to translate mass protest actions into long-term organising for power. And in the summer and fall of 2018, 75 folks signed up to be full-time climate activists through Sunrise Semester, working to create a pro-climate majority in the US Congress and state-level legislatures across the country. As a result of their focus on social movement theory and organising best practices, their campaign efforts align with a number of social science-based strategies around how to effectively build political power. Narrative capacity is about the ability of a movement to change the way an issue (like climate and its intersection with economic opportunity) is covered by the media and understood by the public. Sunrise’s storytelling around the GND combines the “public narrative” arc (a.k.a “Story of self, us, and now”) developed by social scientist Marshall Ganz with the traditional “hero’s journey”. Sunrise activists begin by sharing their personal “story of self”—e.g. how climate has impacted them personally (lost homes to floods, friends with asthma, beloved landscapes that have been destroyed). They then pivot to naming the responsible “villain” (corporate executives, lobbyists, and the politicians with whom they collude). Next, they reaffirm that if we act together (“story of us,” the Heroes! ), we can address climate change through a solution (the GND) commensurate to the scale of the problem (“story of now”). Developing narrative capacity on a campaign is key, because stories allow us to imagine a tomorrow that is dramatically different than the world today. Over 100 Sunrise activists were arrested in multiple protests and sit-ins in Washington, DC in support of climate action and the GND. Disruptive actions are particularly powerful in that they can serve as a proxy measure for how credible a movement’s threats (to those who oppose their efforts) actually are. Research suggests that disruptive protests are most effective when they are large, non-violent, and there is an appearance of unity among the protestors (e.g. coordinated shirts, signs). The activists who risked arrest during the sit-in on 10 December 2018 participated in a training that focused on these principles the previous day. Similarly, Sunrise organisers understood that re-occurring local demonstrations can be even more powerful than ones based in Washington, DC, and thus organised satellite protests in key districts across the country on the same day as the sit-in. Sunrise leaders made a strategic decision to pursue a “champion” strategy, and push Democrats toward bold action on climate change—rather than spend resources trying to persuade folks in the middle or right-of-center. “We only have 12 years to rapidly transform our society and economy to stop climate change, and any politician — regardless of party — who takes money from the fossil fuel billionaires or can’t find the courage to stand for solutions we need to preserve life as we know it should not lead,” Fernandez explains. They started by asking candidates to sign a No Fossil Fuel Money pledge, and then lifted up the candidacies of folks who were supportive and “named and shamed” candidates who were not. They also placed Sunrise Semester activists in states with key, swing races, allowing them to build relationships with candidates like Ocasio-Cortez and Rashida Tlaib. Nineteen out of Sunrise’s 30 endorsed candidates were elected. And the Democratic party—while not meeting all of their demands—has been pushed to talk more about climate and their plans to address it. Recently, Sunrise launched #ChangetheDebate to make sure the GND is addressed in the 2020 Democratic presidential primary debates. These “movement moments” also reinforce the identity of those participating as activists—which research suggests is critical to sustaining participation in political work over the long-term. During the first week of February, two House committees held key hearings on the pressing need for climate change action. As well, Representative Ocasio-Cortez and Senator Edward Markey introduced a non-binding joint resolution calling for the creation of a New Green Deal. Regardless of how the proposal moves forward in this Congress, movement research suggests that the ownership of this issue by a diverse constituency of highly committed young folks and the deluge of media coverage lifting up meaningful, solutions-oriented policies are hugely positive for the climate movement, writ large. I was very impressed with the passion and eloquence of that young guy! Very rare! The Green New Deal is a start to confronting the pollution and inefficiency of our US economy,,, it should not be presented as a Democratic Party program, it should be presented as a Green Party program. Because in 2016 the Green Party presidential nominee Jill Stein was pushing for it. The Dems pushing it automatically makes it a Partisan issue which it is not.